Ty Harp, of Vero Beach, is accused of setting five brush fires Thursday night near Interstate 95. 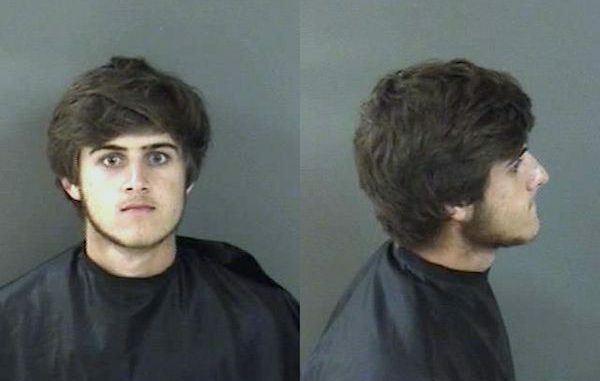 VERO BEACH – A 19-year-old man is accused of setting five brush fires Thursday night near Interstate 95, according to authorities. Indian River County Fire Rescue Battalion Chief Cory Richter said it took four hours and nine fire rescue units to suppress the blaze. The Department of Forestry also helped in extinguishing the flames. Ty Harp, of Vero Beach, was arrested Thursday night on two counts of Felony Intentional or Reckless Burning of Land. Maj. Eric Flowers, spokesman for the Sheriff’s Office, said Harp is accused of setting the fires in five different areas just east of I-95. Richter said the fires were located east of I-95 off 74th Avenue; 90th Avenue; 102nd Avenue and Fourth Street; near State Road 60; and near 98th Avenue and Fourth Street. During a search, a lighter was located in Harp’s front right pocket. He admitted that the lighter was used to start the fires, the report said. Harp was arrested in the 400 block of 102nd Avenue, according to the arrest affidavit. There were no injuries or buildings set on fire during the blaze. The National Weather Service issued a fire warning Wednesday and Thursday of dangerous conditions caused by the weather. The warning was issued after cool and dry mixed air with low humidity, and strong winds became factors that can contribute to the spread of wildfires. Harp is currently in the Indian River County Jail with a $4,000 bond.